For people looking for reference material, please use the archives navigation bar on the right hand side. Before I knew it, time had passed so slowly yet so quickly at the same time and it was already my final day in Venice. Due to the packing, we missed the first boat out and caught the second one at 9am. 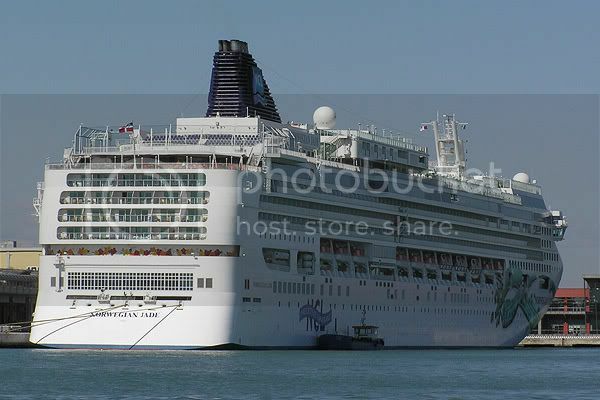 As we entered the Venice city limits against the rising sun, an outline of a gigantic ship threatened to run us over. It was the huge Norwegian Jade cruise ship coming in under tow. For the record, our little motoscafi was producing more waves! 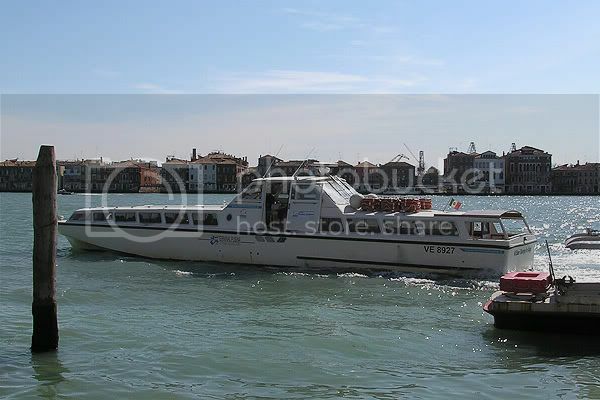 We started exploring the last bit of Venice which was the Dorsoduro area. This is the day's route. The weather was very sunny and the haze of the first 3 days had cleared up which gave us a nice blue sky but also a blazing sun, the day being borderline hot in our winter clothes! We took a peek at a Wine store where we had a sample taste of the local fragolino - strawberry wine. I'm actually a zero alcohol person so I do not know how to wine taste but it tasted fine to me. Glad to get the experience! Near the wine store was a gondola shipyard, the Squero di San Trovaso which is apparently the oldest in the city and one of only three. We headed westwards, heading deeper into the alleys and encountering less and less people, sitting inside a random beautiful church for 5 minutes to relax. 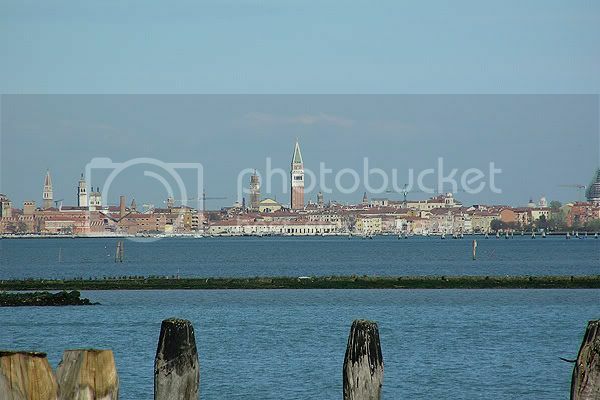 With Venice's sights becoming more familiar and my memory card being almost full, pictures were sparse. 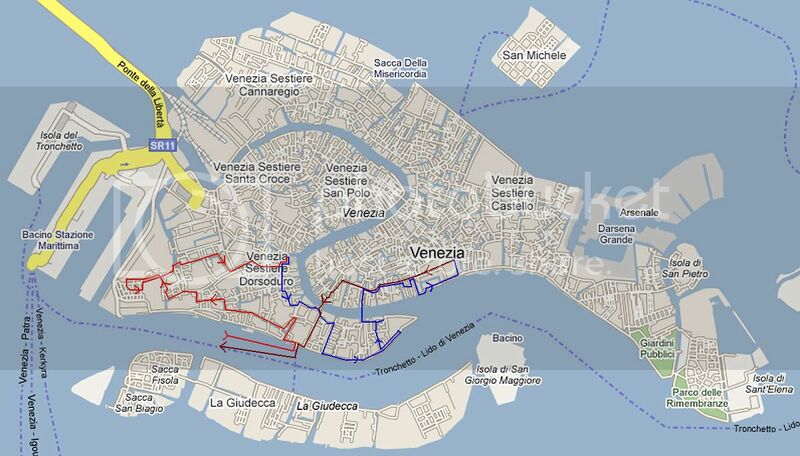 The Lonely Planet map of Venice had proved rather reliable in previous days but it was totally lacking in accuracy for Dorsoduro, which with improvisation was not a problem. We eventually looped back towards the east and encountered a nice wooden bridge. I was also surprised to find that despite the logistical nightmare of Venice, the city actually sorted it garbage with multiple rubbish bins for cans etc. As we continued walking, we found ourselves at a Campo with a decapitated church tower! It was at this very moment that I let my guard down, possibly due to fatigue. I folded the map and tried to navigate through the alleys by memory - and got lost unintentionally for the first time. There goes my theory that "It is possible to not get lost in Venice". Not all was a waste however, as we ended up at the Universita degli Studi Ca Foscari where Neko, a fellow ARIA pilgrim will study the next coming year! It had a nice courtyard with seats at the entrance where we munched down some sandwiches! Another hour gone and I was hungry again. 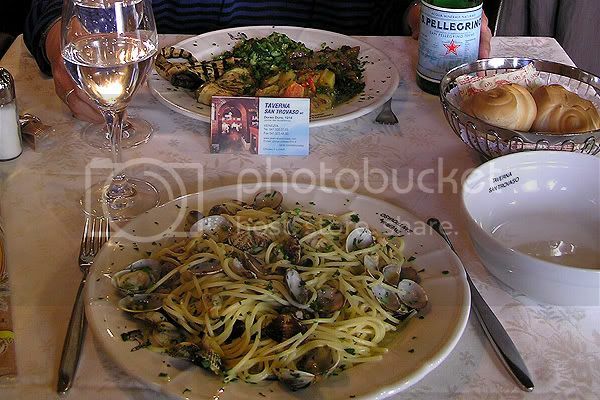 According to a friend's guidebook, Spaghetti ala Vongole (clamshell) is the recommended dish to have in Venice and I had been on the lookout for a place with a decent price (under €10) since Day 1. 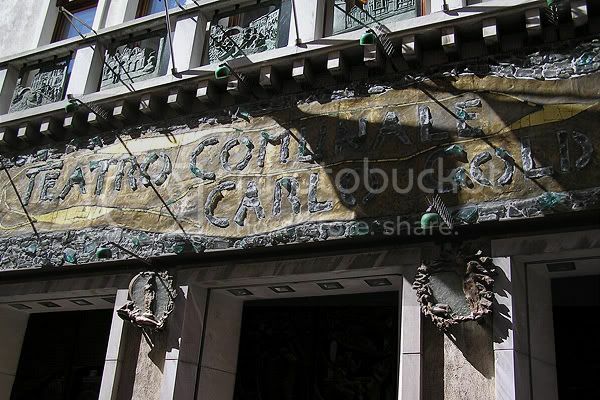 We finally found one and risking getting ripped off with tourist food, went in. The food was very good, if a little rich in oil and definately not tourist garbage. Unknown to me at that time, this tavern was recommended by that same guidebook. 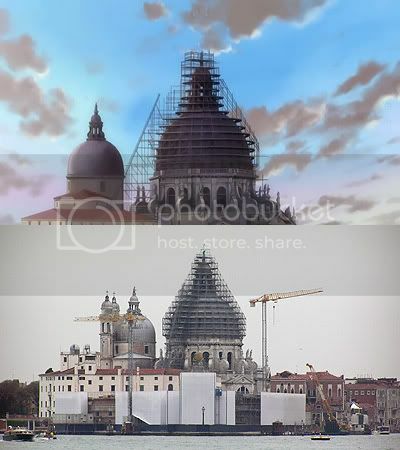 One last place left to go in Dorsoduro which was the Chiesa di Santa Maria della Salute. The whole area was under restoration which also closed a traghetto route. Photography was constrained to wide-angle which I did not have and I already had pictures of that Church. I was a little dissapointed. 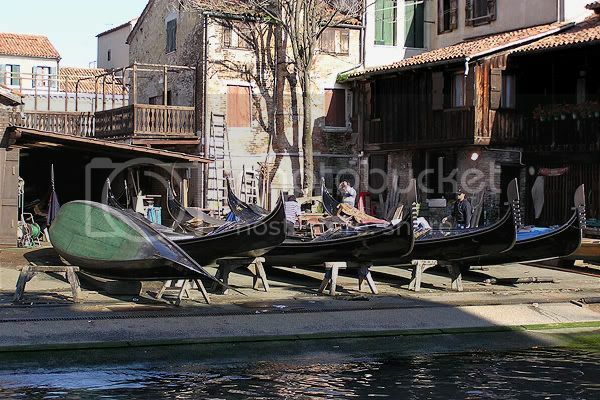 We took a traghetto to save 10 minutes...and who doesn't like gondola rides? Unfortunately, they didn't let me stand due to the low load factor of 3 passengers. A final trip to Piazza San Marco, as we had "forgotten" to visit the Basilica 2 days earlier due to the long queue! The Norwegian Jade had emptied over 1000 lemmings and Piazza San Marco was like a rat race. I miss the quiet of the Piazza at 9am. While there was a long queue for the Campanile due to the crowds, the line for the Basilica was almost empty despite the odds. No backpacks allowed - thanks Mr Terry Wrist. On top of it, no picture taking allowed. 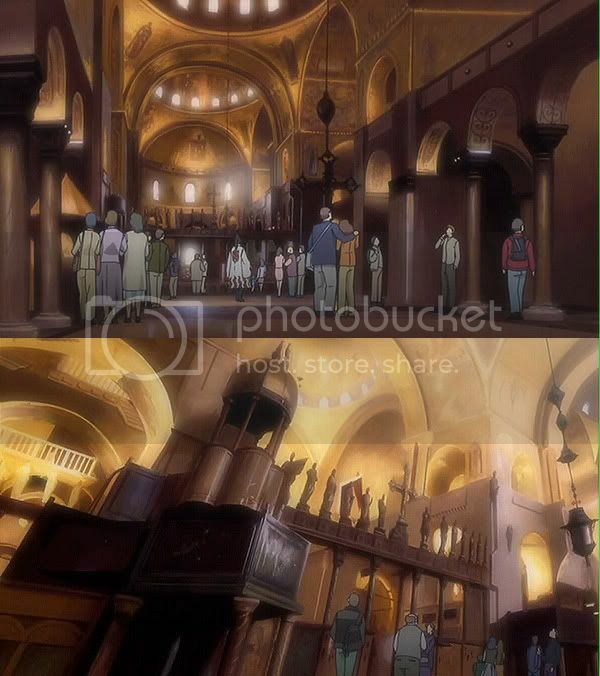 You will have to take my word for it that ARIA the Origination ep5.5 was an accurate depiction of the interior. The ceiling is lined with little bits of gold. 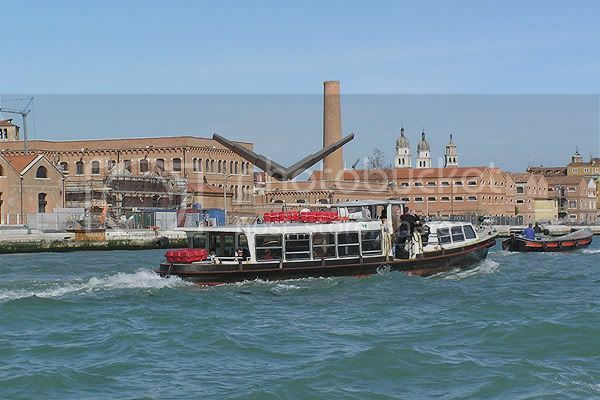 However unlike Neo-Venezia, the floor was uneven (long-term exposure to Aqua Alta?) and the main hall was full of seats and we could not freely roam about as sections were fenced off. While access to the main areas are free, a fee is charged if you want to see the chapels inside or more importantly, Akari's secret spot! The time was approaching 3pm and it was time to take the boat back to our accomodation to collect our luggage, and go to the airport. An interesting use of materials for this sign. One last Gelato was consumed as we arrived at Zattere with 15 minutes to spare. I knew I had memory to burn so I finally started snapping away! Our motoscafi-style boat, the San Giorgio in Alga which we took every morning. An appropriate name as it is named after an abandoned island which the boat passes a zillion times a day on the Fusina - Zattere route. A motoscafi with old factories in the background. 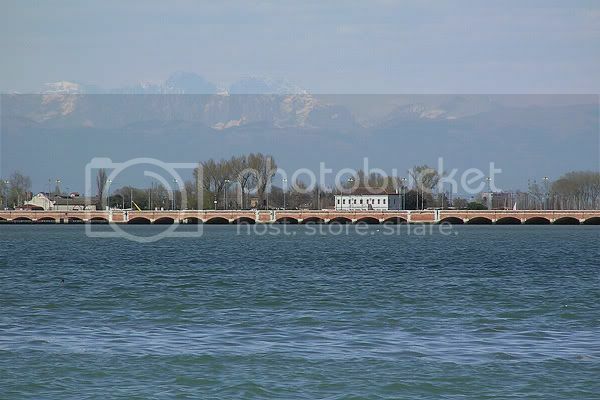 The causeway from Mestre, with the day clear enough to see the Alps. We arrived at Fusina with plenty of time to kill until the next bus to Mestre, so I went snapping pictures. 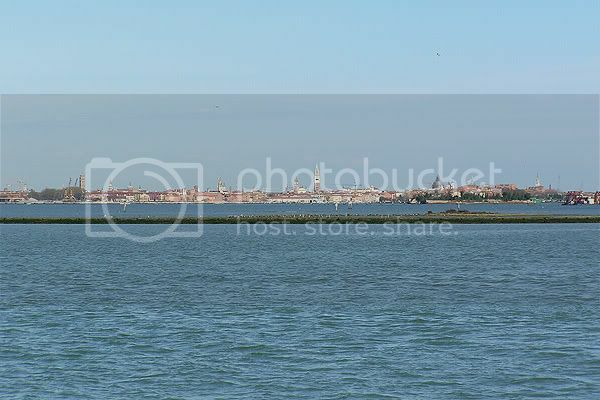 Two views of Venice and the surrounding lagoon from Fusina, at approx 35mm and 300mm zoom. 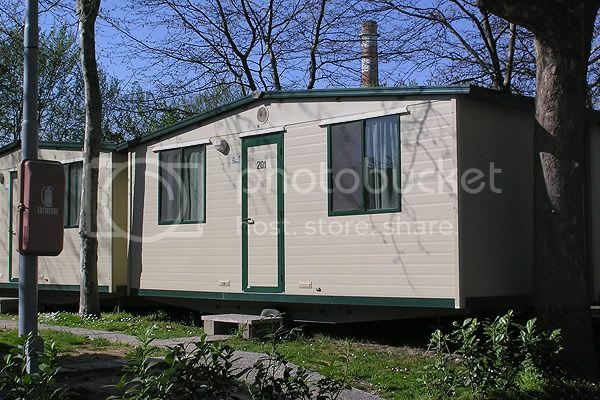 Last picture but not the least, our accomodation! We got half of the trailerhome. We then got our luggage and took the local ACTV bus to the airport, changing busses at Mestre station. This was a long, slow and crowded journey and I was totally knackered at the airport. Our flight was at 8pm and we arrived very early, taking into account Murphy's Law. I am a bit of an aviation nut as well and was observing which runways were in use for departure. Winds negligible, planes taking off in both directions depending on destination. Gambling on a southwesterly runway departure for London, I grabbed the emergency exit row seat (legroom) on the left side of the aircraft and was victorious! I saw Venice and the navigation channels lit up by night in its full glory during climbout! I managed to get some sleep in the plane, despite the lack or recline, light dimming and the in-flight food marketing on Easyjet. 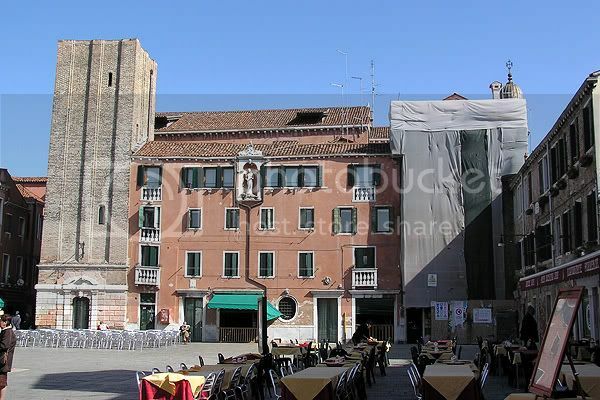 I finally arrived at my dormitory at 12am, feeling a little depressed that my trip to Venice had come to an end. Hmm, I just wanted to ask about the blog today. So, last day, eh? And, btw, this is the end of your blog, or you still have something to share?